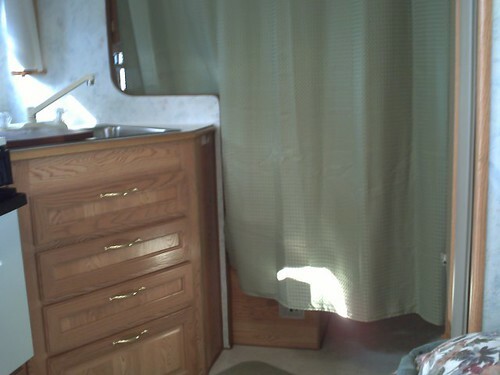 In the T1950 the bath room is not very big, so we installed a curtain to separate the bed room from the rest of the trailer. 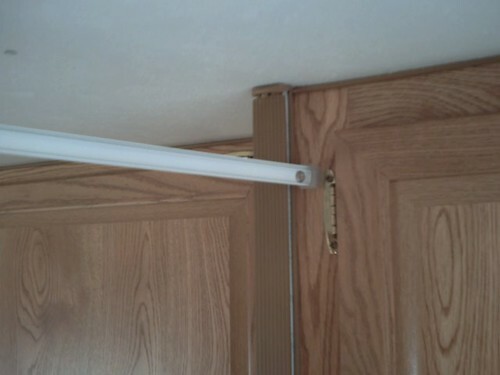 We don’t have to close all the window blinds when we take a shower or when we want to change clothing. 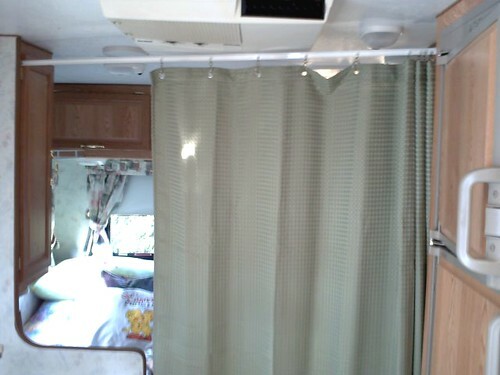 My wife cut the curtain to fit the shape of de bed. The curtain is cut just to the top of the power converter for air circulation. I cut the track approximately one inch more than real measurement that gives the track a small curve and more rigidity. 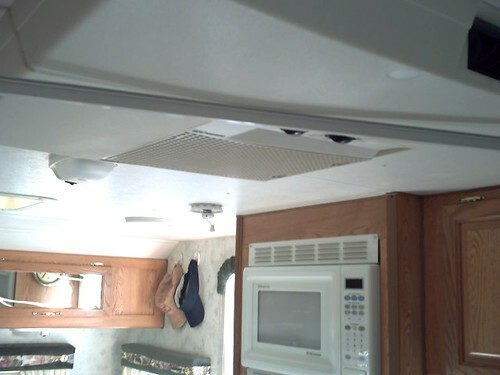 The track is about ¼ inch from the air conditioner. 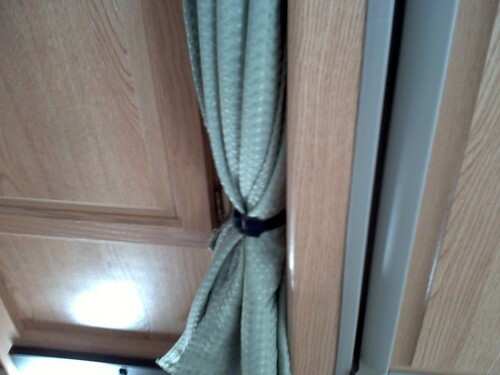 We use velcro to maintain the curtain closed when it is not used. We have now the impression to have a very large bath room. Nous avons installé un rideau pour séparer la chambre à couché du reste de la roulotte. Nous n’avons plus à fermer tous les stores quand on prend une douche ou que l’on veut changer d’habillement. Mon épouse a coupé le rideau pour l’adapter à la forme du lit. Le rideau est coupé juste au dessus du convertisseur de courant pour ne pas nuire à la circulation d’air. J’ai coupé la pole environ un pouce de plus que la mesure réel ça lui donne une petite courbe et plus de rigidité. La pole est a environ ¼ de pouce du climatiseur. 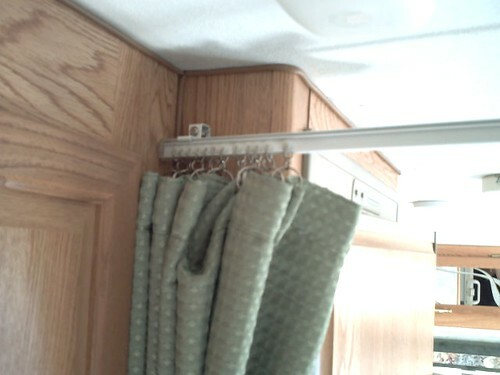 Nous utilisons du velcro pour maintenir le rideau fermé quand il n’est pas utilisé. Nous avons maintenant l’impression d’avoir une très grande chambre de bain. PS: Nothing wrong with your English...so no need to be sorry! We had one in our 15.5 SB and used the same, I mean identical, curtain. Very nice pics and post Thank you for sharing with us. They look great! Also your English comes thur very well. No worries here from us. It is also good to see the French text too, maybe more of the good people from the North will come and add to the forum. 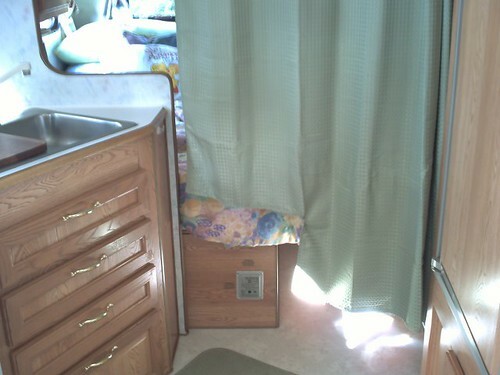 I'm camping in Quebec and Ontario, and in the pass two years I met several owners of Sunline, I always give them the website address of the Sunline Club. But I know that some are not able to write in English. 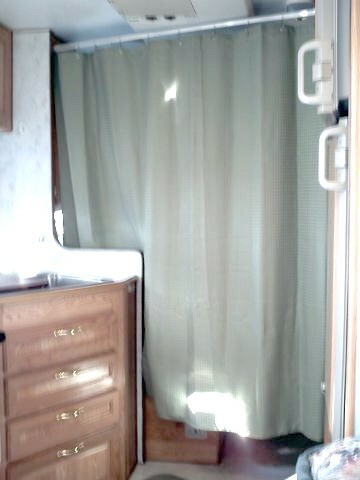 We have the 2499 that had a sliding door between the bedroom and the bathroom and took it off to save on weight and room.